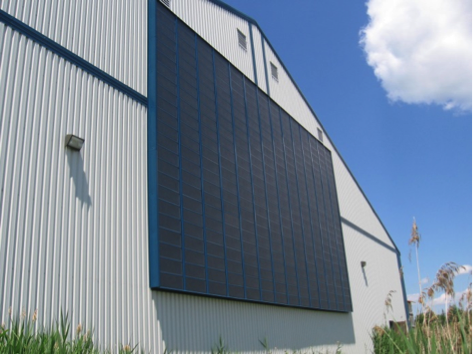 Magog’s Tennis Club and Fitness Center innovates and becomes eco-responsible with the installation of a solar air collector on its building. Magog’s Tennis Club and Fitness Center and Enerconcept Technologies have just completed the installation of a solar air ventilation and destratification system on the Tennis Club’s building. With these improvements, indoor air will be renewed every hour by allowing fresh and healthy outside air into the building through the ventilation system. This free, solar-heated air will dehumidify indoor air, improve air quality and help save more than 110,000 kWh per year. Covering 100 square meters, the solar collector produces nearly 800 KW of heat in direct sunlight. This patented technology was invented in Magog, Quebec, and is now exported worldwide. Magog’s residents can play tennis on clay courts all year around. With this new system, they will play on a dryer surface and breathe much healthier air while practicing their sport according to Mr. 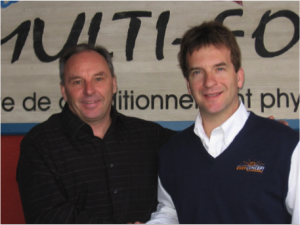 Guy Duquette, Magog’s Tennis Club and Fitness Center’s general manager. For more information, please contact Mr. Guy Duquette at 819-868-0444 or by email at guy@clubsportifmagog.com.